Welcome to the second post in my anti-inflammatory lifestyle series. If you missed the first post on healing inflammation through anti-inflammatory living, you can check that out here. For my second post, we’re going to get into some healthy anti-inflammatory breakfast recipes that can naturally help prevent and heal inflammation, as well as look at creating a morning routine that can help you de-stress and live a calmed yet more productive live. An important aspect of being able to maintain a healthy diet is being prepared. For me that means weekly meal planning, grocery shopping and food prep. Having healthy snacks ready is key, as is being prepared with options for lunch and dinner. Depending on how much time you have in the morning, it can also help to prep your breakfasts ahead of time. I do my planning and prep every Sunday because that’s what works for my schedule. Some people prefer to do two or three smaller preps throughout the week. Whatever method works for you, I would highly recommend making at least some food prep a part of your weekly routine. Try to look at it as a time to invest in yourself rather than a chore you have to do. Throw some music or a podcast on, or share the prep with your partner or a friend and just hang out. You don’t have to run out and buy every item on this list however, having these anti-inflammatory staples on hand will make creating healthy recipes that much easier. Slowly start adding these to your kitchen as you experiment with anti-inflammatory cooking and baking. You can also check out my post on How to Stock a Plant-Based Pantry for more suggestions. 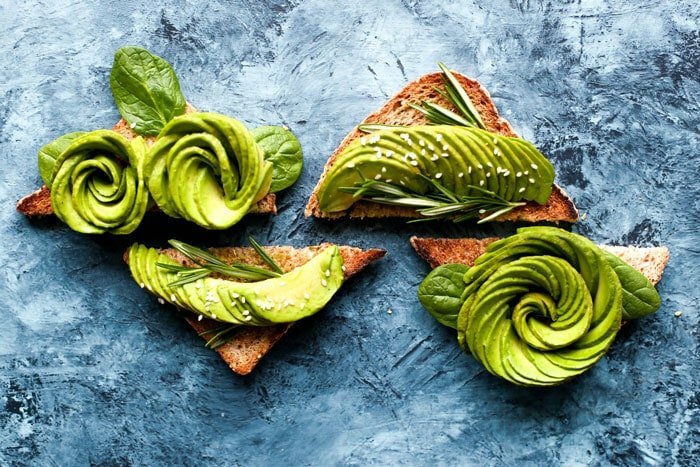 Extra-virgin, cold-pressed olive oil (look for oils that have been “cold-pressed” or “expeller-pressed” to ensure they weren’t processed using heat that could potentially damage the oil), avocado oil is another option. Organic coconut oil for cooking and baking – this is a better option than olive oil to use at higher heats, we talked about the dangers of heating oils in the last anti-inflammatory post. Onions and garlic – for adding flavour and nutrition to recipes. Natural sweeteners (for occasional use, in moderation) – agave syrup, brown rice syrup, pure maple syrup, dates. I typical only have pure maple syrup and dates on hand. Gluten-free flours (if you plan on baking) – try almond flour, coconut flour, brown rice flour and buckwheat flour. Lemons and limes – for adding to drinking water and seasoning recipes. Various vinegars – for using in dressings and seasoning recipes, apple cider vinegar, balsamic vinegar, white wine vinegar etc. Dried herbs and spices – for seasoning recipes without using excess salt, spices such as curry and turmeric have anti-inflammatory properties and any other spices such as cinnamon and cumin pack their own host of health benefits. Unrefined sea salt – refined table salt does not contain any minerals, opt for an unrefined, quality sea salt to flavour your food while adding important tracer minerals. I recommend a good grey or pink sea salt. Various nuts – for snacking and recipes, try walnuts, almonds, cashews and pecans. Various seeds – for snacking and recipes, try chia seeds, hemp seeds, flax seeds, sunflower seed and pepitas. Lots of fresh fruits and vegetables – go for as many colours as you can and vary weekly, frozen is good too. Gluten-free grains – brown rice, amaranth, quinoa, gluten-free oats, millet, teff. Nut butters – try cashew butter and almond butter, you can also make your own. Canned and dried beans and legumes – try garbanzo beans, red lentils, black beans, kidney beans, fava beans and cannelini beans. These are some of my other favourite inflammation-fighting staples. They’re definetley not required but they all offer a range of health benefits and have anti-inflammatory properties. Sauerkraut, kimchi and/or kombucha – homemade or store-bought to support healthy gut flora. Fresh ginger for recipes and tea – for adding to smoothies, curries, soups, dressings and for making ginger tea. Green tea, white tea, rooibos tea – high in antioxidants and phytonutrients. Holy Basil (Tulsi) tea – stress-relieving, anti-inflammatory, regulates blood pressure and sugar, improves digestion and eliminates toxins, my favourite time to drink this in the evenings before bed but it’s nice any time of day, it’s particularly effective combined with fresh ginger or chamomile tea. Filtered water – if you can, use filtered water for cooking and drinking and even in your shower to prevent toxins from being absorbed through the skin. 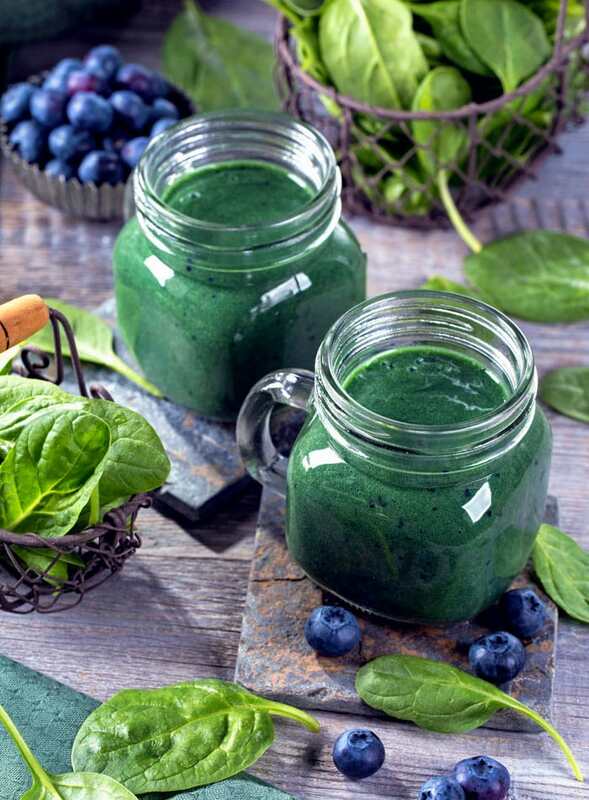 Spirulina and chlorella – my two favourite superfoods for adding protein, antioxidants, minerals, essential fatty acids and detoxification properties to smoothies. How we start our mornings is so important to our overall health and success in life. The start to your day matters; win the morning and win the day. Every single day of your life is a clean slate to create the life of your dreams. Consistent, effective morning routines are a big part of creating that life. There’s a lot of power in the first hour of your day. Use that time to create momentum that spills over into your day and sets you up for success. I’ve talked in detail about my evening routine for better sleep and why it’s so important. You need to create evening routines for better sleep so you can get up and have a healthy morning. We also talked about the importance of sleep when it comes to inflammation, so before we get into some tips for a healthy and healing morning routine, don’t forget: a great morning starts the night before. If you could improve your sleep habits and evening routines, head over and read this post: Sleeping Well: Tips for Better Sleep. I do all of these in my own way every single day and I can’t tell you the positive effects that this has on my life. 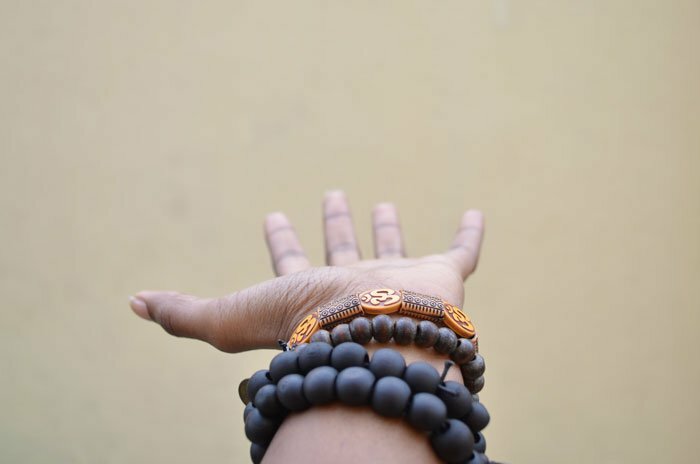 I get clear about my goals, think about what I’m grateful for, move my body, give it nourishment, do some affirmations and spend time reading and writing. Once I’m done my morning self-development routine, it continues as I go walk the dogs. I listen to a podcast while I walk, then come home and have a nourishing breakfast. To accomplish all this, I get up at 4:45 am. Maybe that’s not realistic for you and that’s totally fine. If you only have 30 minutes for yourself in the morning, even that is enough time for a healing, inspiring and effective morning routine that will build momentum for a healthy and productive day. What does this have to do with inflammation? In part one of this series we talked about the negative effects that high stress levels can have on our physical and mental health. How does it feel when you get up late and rush out the door? Probably not very good. Your cortisol levels are elevated, stress is maxed, you might have skipped a healthy breakfast and by not doing anything to put yourself at an advantage, you’re robbing yourself the opportunity to reach your full potential. And running late always puts us at a psychological disadvantage. It just doesn’t feel good. What’s the alternative to starting your day with rush and stress that increases cortisol and adrenaline levels? What if you got up an hour earlier than you had to and spent that time on self-improvement? 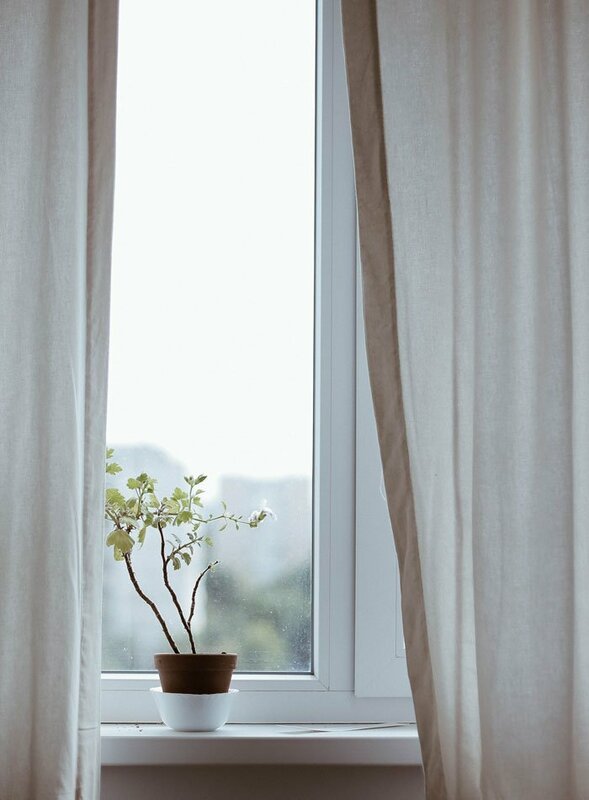 A quiet and relaxing morning routine that includes mediation, movement, affirmations, learning and purposeful goal-setting can have a positive compounding effect on all aspects of your health. If you start the day by pressing the snooze button you are starting the day with procrastination. You’re telling the universe that it’s more important for you to stay in bed than it is to get up and chase your dreams. Get up as soon as that alarm goes off. If you’re not popping out of bed with joy and excitement every day, make the necessary changes in your life until you do. As soon as you wake up, say hey, I’m alive and I’m so grateful for another day on this planet! The fact that you’re alive, healthy and have the opportunity to live another day is pretty damn awesome. This is a habit I’ve cultivated in the last year and it’s just not a question any more. I used to reach for my phone as soon as I got up to check all my social media accounts for the blog. This teaches us to be reactive instead of proactive. Getting that dopamine fix off a little red notification is not how I want to start my day. It trains us to be reactive instead of proactive. Don’t put yourself at the mercy of other peoples agenda. There are so many things vying for your attention today. By not checking your phone, you get to decide where your attention goes. Put your goals and needs first. How do you serve at a higher level? You take care of yourself first so you can show up as the best version of yourself for others. Focus on your own objective and spend the morning finding a sense of peace and connectivity. This can help focus on what you want to achieve. I use my phone for reading and meditation but I do not check any social media or email accounts until after my morning routine is complete. I’m going to be getting into more detail about morning routines in an upcoming blog post, but for now I suggest trying these techniques to create your own healthy morning routine as part of an anti-inflammatory lifestyle. 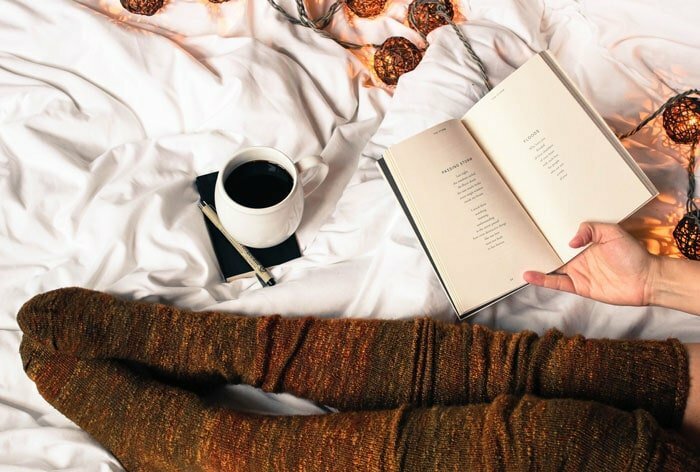 Your morning routine could consist of 10 minutes, 30 minutes, an hour of more. Find something realistic that works for you. It doesn’t need to be lengthly. If you ‘re very limited for time, I would recommend hydration, 5 minutes of exercise, listing 3 tings you’re grateful for, reading a couple pages of a book and a quick review of your big goals. The main thing is to get your mind and heart in the right place for a positive, productive, focused day. This is the first thing I do every single morning. Water brings you to life in the morning. You’ve been asleep for 6-9 hours so it’s important to re-hydrate right away when you wake up. I drink a large glass of warm water with lemon or apple cider vinegar as soon as I wake up. Warm or room temperature water is much gentler on the body that ice water is, especially in the morning. After a night of repair, there’s also lot of metabolic waste built up and drinking water helps kick-start the process of clearing that out. Hydration helps get things moving, improve circulation and wake up your digestive system. We’ve already discussed the role hydration plays in inflammation so get up and get that glass of water in! After I drink a big glass of water and turn on the kettle on for my mushroom coffee, I spend 10 minutes stretching and going through some quick yoga postures. I used to workout first thing in the morning and I still do some days but now that I usually train in the evenings, my mornings consist of gentler exercise just to wake up my body, start creating some energy, get my circulation going and start moving some oxygen around. It doesn’t really matter what you do. It could be 10 minutes of callisthenics, a brisk walk, a yoga video or a longer workout. The important thing is that you start your day at a metabolic advantage by doing some exercise. There was a study done by the Appalachian University that showed morning exercises spend the most time in the deepest, most anabolic stages of sleep so even if you workout in the afternoons or evenings, a quick morning exercise routine is still an excellent healthy habit to develop. In the last post we talked about the roll exercise plays in healing and preventing inflammation, so however you want to move in the morning is up to you but just do something. When we wake up and the brain in still in that alpha-state, it’s highly impressionable. This is a great time to feed your mind. 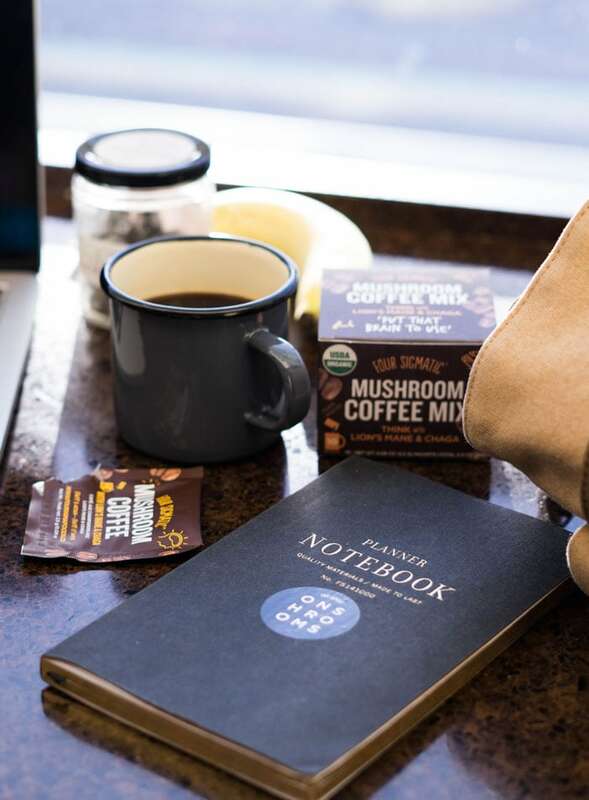 Every morning, after my water and stretch, I sit down with my Four Sigmatic Mushroom Coffee and do some reading and writing. I highly suggest you make time to feed you mind first thing in the morning. If you’re limited for time, surely you can squeeze in 5 or 10 minutes. Do this every single day and watch your life transform. Knowledge builds like compound interest so keep learning, every day. If you can’t make time to sit down and read, throw a podcast on while you’re getting ready. If you read for 30 minutes a day, every single day, you could finish approximately 52 books a year. Imagine how much knowledge you could accumulate in that year. If you only have 10 minutes, do that, even if it’s just a couple pages, something is always better than nothing. Reading and learning opens our minds, keeps our brains young and build self-esteem. If there is one thing you take from this list, make time for daily reading. Leaders are readers and if you’re not reading you’re falling behind. I usually read self-development books in the morning which can include topics from psychology, to fitness, to philosophy and productivity. Just something that makes me think and helps me learn something, expand my mind and improve in one way or another. Most people overestimate what they can do in a day or a week but underestimate what they can do in a year. If you want to be somewhere substantially different a year from now, read 30 minutes a day. Spend a couple minutes every morning expressing gratitude for what you have in your life. Write it down. Giving thanks for what we have is one of the fastest ways to transform your outlook on life. I recommend The Five Minute Journal for this. 5. Set goals and intentions. Take a few moments to make a plan for your day. Set an intention and think about the one thing you will do today to move you close towards your goals. By having a clear plan for our day, as detailed as it needs to be, we can go into the day with the confidence to chase those dreams. I’ve struggled to maintain a consistent meditation practice but I do try to spend 10 minutes a day as often as I remember to. I’m putting it on the list because it’s benefits can’t be ignored. From lower stress levels, less anxiety, more focus, improved mindfulness, better productivity, to a calmer life, to even lower blood pressure, the list of benefits goes on. If you listen to podcasts and read from the greats, you will notice that every highly successful person has a meditation practice. From Warren Buffet, to Richard Simmons, to Jerry Seinfeld, Kobe Bryant, Oprah, Steve Jobs and just about every other person of influence, you will find they all have a daily mediation practice. If you’re unsure of where to start, there are many fantastic apps and podcasts you an use to help you get started but even just sitting quietly with your eyes close for 5 minutes and practicing deep breathing can have a profound effect on your overall wellness. You can also use your meditation time for visualization. Try picturing the day ahead of you, seeing yourself making nourishing food choices and accomplishing your daily goals. The mind is the most powerful tool we have and if you can learn to use it there is no limit to what you can accomplish or how joyful your life can be on a daily basis. No matter how you make your morning routine work, I really believe having some kind of morning routine is important in helping you life your best life. Starting your day with the healthy habits we talked about helps manage stress, reduce anxiety and boost your energy, among so many other benefits, all of which play a role in inflammation. At some point during your morning routine, it will be time to eat a healthy, balanced, health-promoting breakfast, so let’s get into that. We’re going to have a look at a couple of healing teas you can enjoy, a superfood smoothie packed with omega-3, fibre and antioxidants, a chickpea scramble stuffed sweet potato with sautéed kale and avocado, chocolate chia hemp seed pudding, and a warming, comforting and nourishing porridge recipe that can be made in the morning or the day before. I’m sure many of you have morning coffee habits and that’s totally fine. If you do drink caffeine and aren’t sensitive to it, a morning cup of organic coffee does have it’s health benefits. However, if you have an inflammatory condition, you may want to consider cutting out your morning cup of coffee and opting for one of these nourishing drinks instead. Enjoy these drinks after you’ve had your big glass of morning water and don’t forget if you do choose a caffeinated beverage to balance it with water as caffeine is a diuretic. Ginger tea is a simple, warming, nourishing and anti-inflammatory drink you can enjoy any time of day and is perfect for mornings as an alternative to coffee or other caffeinated drinks. I make mine with just ginger and lemon but you can add a bit of sweetener and turmeric for more flavour. Options for sweetening include raw honey, brown rice syrup, pure maple syrup or agave nectar. 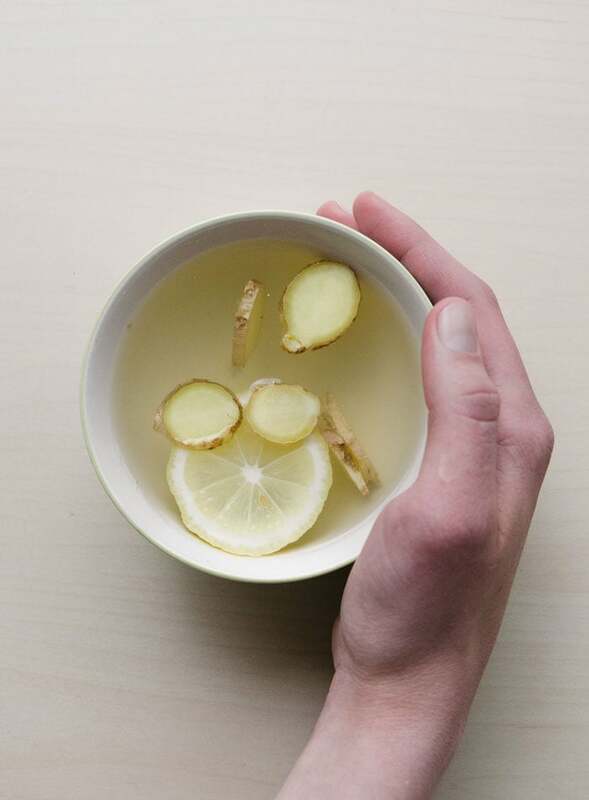 Enjoy ginger tea for a soothing drink with healing properties. Ginger tea is delicious made wiht just fresh ginger root but you can also try optional add-ins such as lemon, sweetener and turmeric. This can also be prepared the night before or even steeped overnight in the fridge to enjoy as your morning hydrating drink. Boil water in a kettle, let it settle then pour the just-boiled water into a mug with the peeled and sliced ginger and let sit for 5-10 minutes, or to taste. Strain the ginger pieces out. Add optional lemon, optional sweetener such as raw honey, whole leaf stevia powder or stevia extract, brown rice syrup, agave nectar or pure maple syrup and a pinch of turmeric. Bring the ginger and water to a light boil stovetop and let boil for 15-10 minutes, covered. The longer it simmers, the stronger it will be. Remove from heat and add lemon, optional sweetener and a pinch of turmeric if you’d like. Drinking a cup of herbal healing tea every day is delicious and soothing way to hydrate the body and take advantage of the many health benefits various herbs offer. Making your own teas from whole plant parts is a fun and inexpensive alternative to prepackaged tea bags. You can use the infusion method to prepare tea from flowers, leaves, finely chopped roots and soft plant parts. For resins, roots, seeds and other hard plant parts, you’ll want to use the decoction method and actually boil them for a period of time. You can find these various teas in tea bags, dried and even as fresh leaves, herbs, roots and flowers. Here are a few beautifully healing teas you can try at home. Nettle Leaf Tea – Nettle is a good source of potassium, calcium and magnesium. Can be infused from 20 minutes up until overnight. Try combining it with green tea. Burdock Root Tea – A strong liver detoxifier and hormone-balance herb. You may be be able to find fresh burdock root, if not, you can use dried chopped burdock to make tea. Gingseng Tea – Readily available in prepared tea bags but can also be purchased fresh. Use the decoction method if using fresh ginseng root. Liquorice Tea – One of my favourites! Liquorice root is a wonderfully sweet way to enjoy some anti-inflammatory benefits. Liquorice root is calming for the stomach lining, contains gycyrrhizin which is anti-inflammatory and can relieve exhausted adrenals and nerves while providing energy. Readily available in tea bags and if you can find it, fresh licorice root. 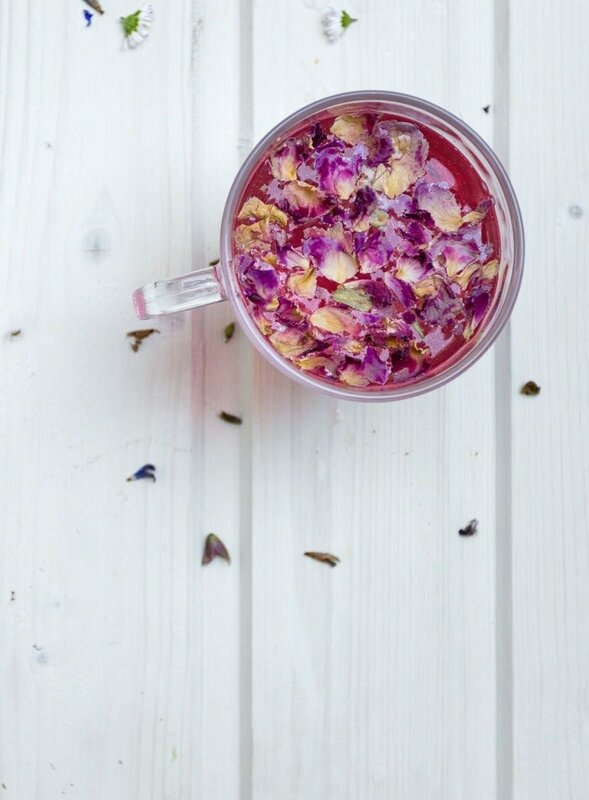 Rose hip tea – Rose hips, a small fruit that forms at the base of a rose flower, are very high in vitamin C which supports the immune system and antioxidants know as flavonoids helping to inhibit the damage caused by free radicals. They’re often added to herbal tea blends but taste great on their own too. Add dried rose hips to a mug and pour boiled water over them to steep, then strain and enjoy. Holy Basil – Holy Basil, also called tulsi, is known to reduce stress, enhance stamina, relieve inflammation, eliminate toxins and improve digestion as well as provide antioxidants and other nutritions. Readily available in tea bags. You can also find it in powder form adding to smoothies and homemade elixirs. Try combining these to make different flavour combinations. 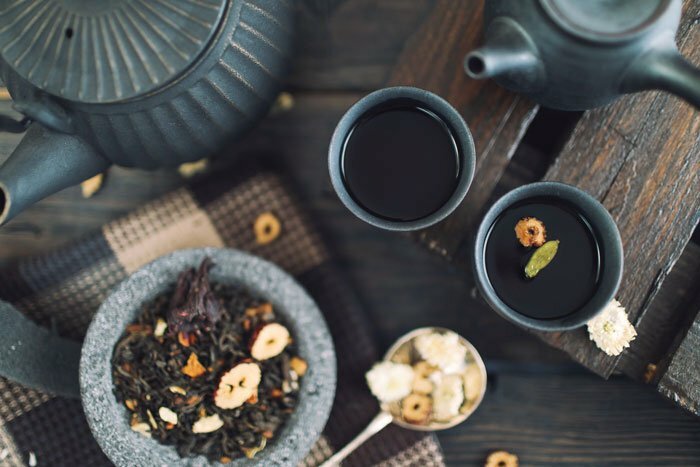 Chamomile and holy basil or rose hip is delicious, white tea can be mixed with ginseng, burdock or nettle leaf, dandelion tea can be mixed with green tea and so on. Feel free to experiment! If you’re like and love coffee but are sensitive to caffeine, there are some wonderful coffee alternatives will give you that coffee fix without the jitters, anxiousness or digestive issues it can cause. 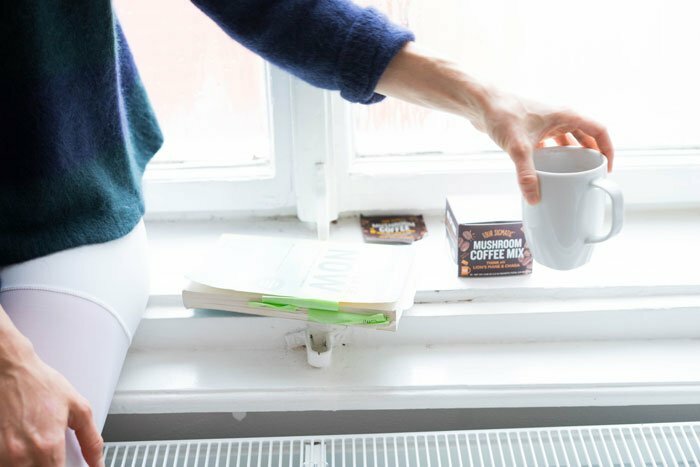 I’m absolutely hooked on all things Four Sigmatic. I love the company and I love their products. If you’re a coffee lover you’ve got to try their Mushroom Coffee. It contains just 50 mg of caffeine per serving, is made with high-quality organic coffee and comes in either Lion’s Mane and Chaga or Cordyceps. I love both. 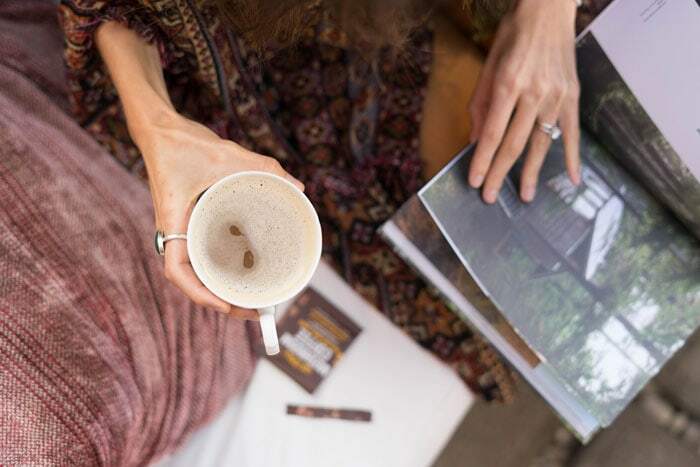 They taste just like coffee, come with a ton of amazing health benefits such as reduced stress and anxiety, more energy, immune support, antioxidants, phytonutrients and they make amazing mushroom lattes. The health benefits of mushrooms, the original superfood, can’t be denied. If you’re caffeine-free, Four Sigmatic also has mushroom elixirs that aren’t made with coffee as well as superfood blends that can be added to smoothies. I can’t recommend their products enough! I drink a range of their products every single day and love them all. Four Sigmatic has offered Running on Real Food readers 10% off with the code RUNNINGONREALFOOD at check-out. Click here to purchase. Dandy Blend is a delicious and healthy caffeine-free alternative coffee. It taste great and I love it on it’s own or blended with plant-based milk or vanilla protein powder. It has a rich, smooth coffee flavour with no acidity or bitterness. I even use it to make coffee smoothies and have also added it to oatmeal. Depending on how much powder you use, it can taste like anything from nutty roasted tea to strong espresso flavour. I usually go somewhere in between the two. Aside from tasting great and being an excellent alternative to coffee, Dandy Blend is the easiest way to enjoy the benefits of dandelion root, which include liver detoxification, blood purifying, improved digestion, kidney and immune support as well as being a source of trace minerals, potassium, iron, antioxidants and phytonutrients. All of which play a roll in reducing inflammation. I love the stuff! I love myself a beautiful matcha latte first thing in the morning. I can no longer handle the caffeine of a whole cup of coffee but matcha I can do. I love to make matcha blended with a bit of coconut oil, coconut butter or MCT oil and some plant-based milk for an extra creamy, frothy drink. You can also blend in various superfood powders and herbs to bump up it’s healing powers even further. I talked about what kind of matcha to buy in this post. 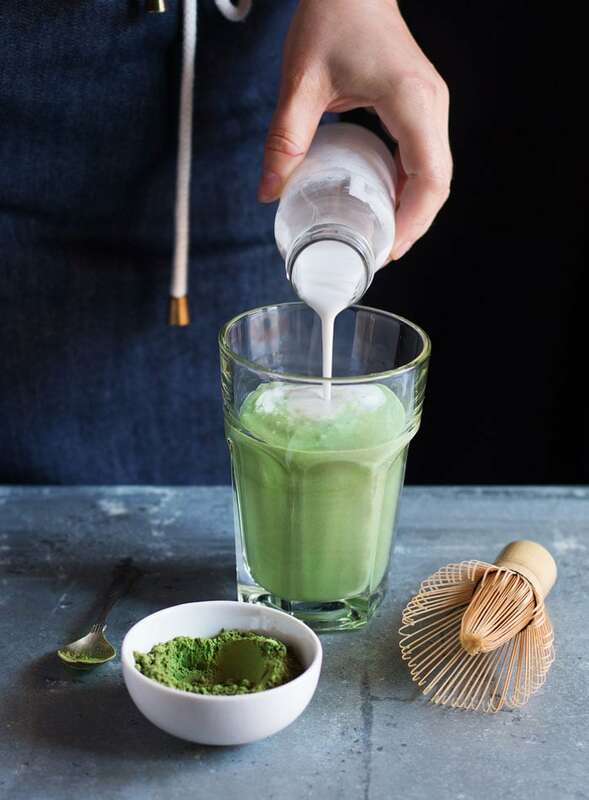 Matcha powder can can either be gently mixed with just boiled water or blended with optional sweetener and a plant-based milk to make a nourishing matcha latte. 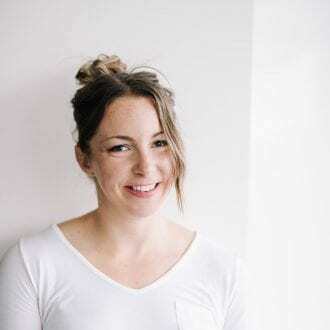 We talked about the importance of antioxidants and phytonutrients when it comes to healing inflammation and matcha is chock-full of them making it a great option for a bit of caffeine while still enjoy some healing, anti-inflammatory properties. Alright, we’ve covered some wonderful drinks you can start your day with, let’s move on to food. Since I eat a plant-based diet, I will not be covering breakfasts with eggs, dairy or meat. The recipes below are free from all common allergens we covered in the last inflammation post, as in they’re all gluten-free, soy-free, dairy-free, egg-free, oil-free and refined sugar-free. 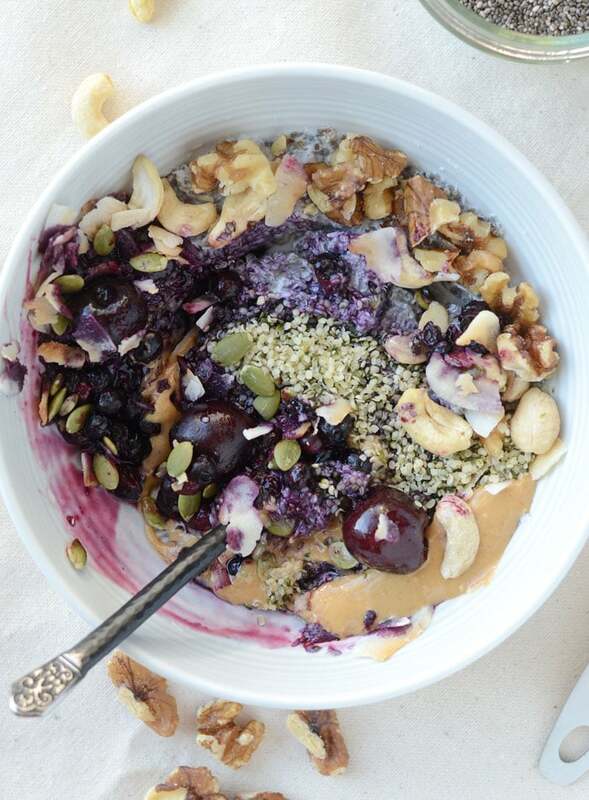 You can use these recipe ideas to inspire you to create your own anti-inflammatory breakfasts. Smoothies are an easy way to enjoy many anti-inflammatory foods and are especially handy if you don’t have time to sit down and eat. The rest of the recipes on this list can be prepared a head of time or made the morning of. Many of the ingredients can be swapped out for similar ones. Seeds and nuts are all easily interchangeable, chickpeas can be swapped with any other beans or lentils, kale can be swapped for any other leafy green and so on. At the end of this post, I’ve linked to more recipes you can enjoy for a healthy and anti-inflammatory morning meal. There are many different ingredients you can include in smoothies to give them inflammation-healing properties. This smoothie is loaded with antioxidants, fiber, protein and nourishing anti-inflammatory ingredients. It can be enjoyed anytime of day for a healthy and energizing snack or meal. Stuffed sweet potatoes are one my favourite breakfasts. You can sweet or savoury with them and they’re completely customizable to whatever you have on hand or whatever you feel like eating. 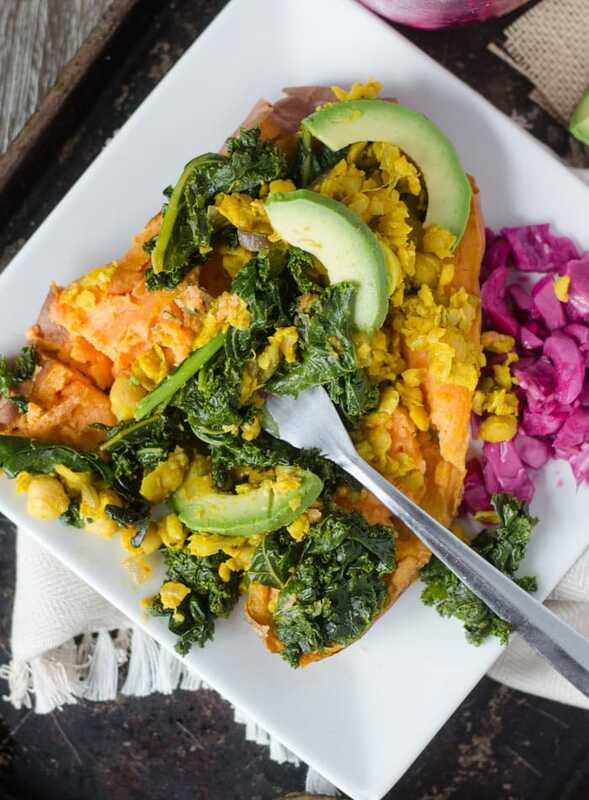 Today we’re checking out a savoury sweet potato stuffed with a turmeric chickpea scramble, sautéed kale and avocado. The chickpeas and sweet potato can be made ahead of time so this is a great recipe for food prep. 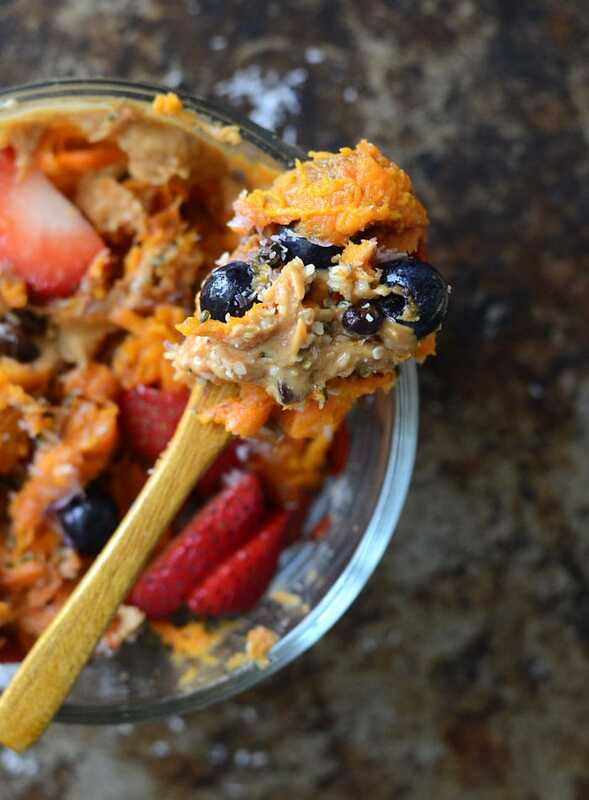 You can check out my Sweet Potato Breakfast Bowls if you want to try stuffed sweet potatoes that are on the sweeter side but still anti-inflammatory. 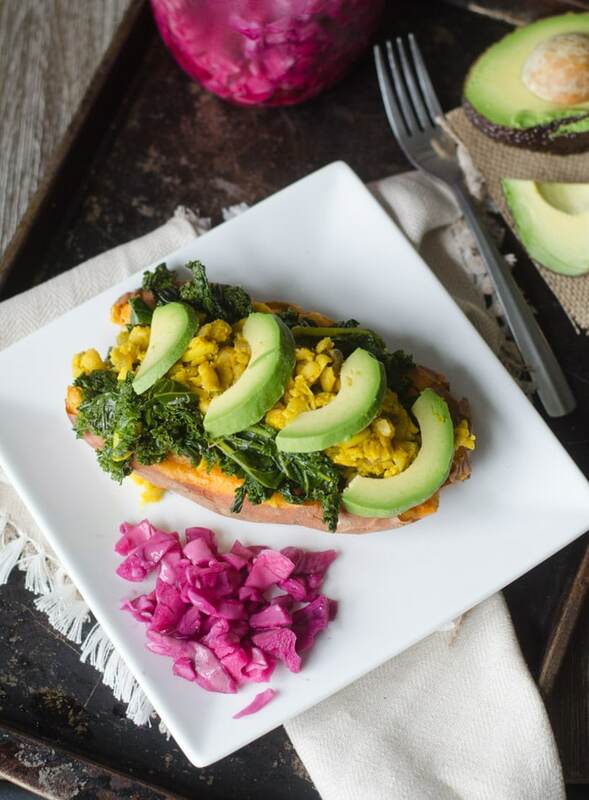 This beautiful, satisfying and nutritious savoury breakfast is full of energizing complex carbohydrates, tons of antioxidants, it contains protein and healthy fats and each ingredient offers its own host of benefits that fight inflammation. Feel free to add extra veggies to the chickpea scramble. A handful of fresh spinach, diced green peppers or broccoli would work well. This nourishing breakfast is loaded with nutrition and tastes absolutely amazing. It’s completely plant-based, it’s oil-free, gluten-free, sugar-free, egg-free and dairy-free for a wholesome breakfast anyone can enjoy. Add the onions and garlic to a pan and cook over medium heat with a splash of water until softened, about 3 or 4 minutes. Add the chickpeas, salt, turmeric and optional nutritional yeast and another splash of water (or you can cook in vegetable stock for extra flavour). Cook, stirring, for about 10 minutes, adding more water as needed so it doesn’t dry out. Use the back of a wooden spoon to smash the chickpeas up, I like to leave about 1/3 of them whole and smash the rest up so it’s a scrambled texture. Add the kale to a pan with some water, vegetable stock or avocado oil and cook over medium heat until soft. Add some diced onion and garlic if you like. Place one small whole baked sweet potato on a plate and cut it lengthwise, opening it make room for the kale and chickpeas. If you can’t find small sweet potatoes, you can use half a medium to large sweet potato, sweet potato chunks or mashed sweet potato. It’s all going in the same place anyways! Top with the sautéed kale, chickpea scramble and avocado and enjoy. This creamy whole grain porridge can be made with any gluten-free whole grain such as quinoa, amaranth, teff or brown rice. It’s a great way to use up leftover cooked grains and can be customized with different add-ins every time you make it. I love walnuts, blueberries, apple and a few chopped dates or dried cranberries but any seeds, nuts and fruits will do. You can also vary the spices and try things like cardamom, cinnamon, ginger, nutmeg, pumpkin pie spice and cloves. You can even just heat the whole grain with your favourite plant-based milk and a sweetener of choice then add the toppings afterwards. It’s incredibly comforting and nourishing, especially on a cold day and if the grains are cooked ahead of time, it takes less than 10 minutes to have it on the table. This quick whole grain porridge is more of a guideline than a recipe. Choose your whole grain, nuts, seeds, fruits, optional sweetener, optional add-ins, add it all to a saucepan and heat until warm and creamy. 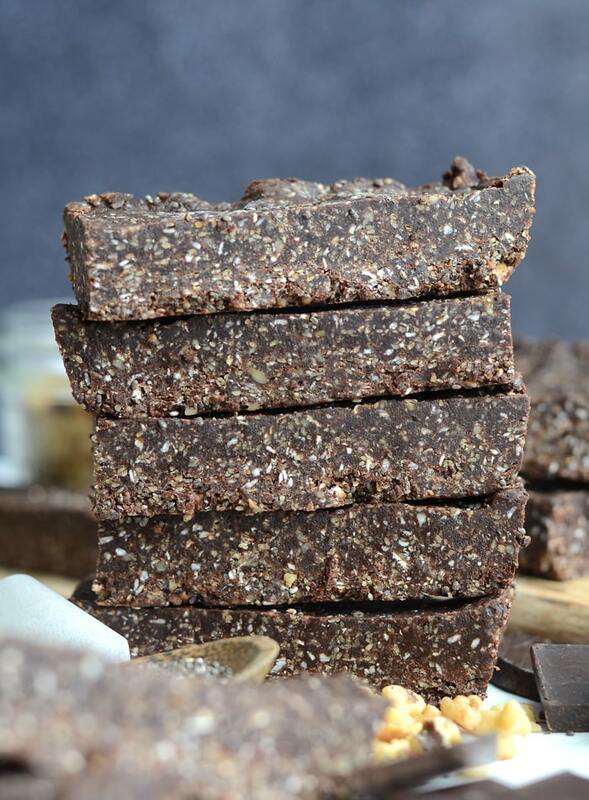 If desired, top with berries, sliced banana or a spoonful of almond butter and enjoy. Add all ingredients to a saucepan on the stove. Heat over medium heat, adding a bit of extra milk if needed to reach a porridge consistency. Warm over medium heat until heated through and everything is nice and soft and creamy. This can easily be double or tripled if needed. You really can’t go wrong and there’s not need to follow the recipe exactly. Use about 1/2 cup of cooked whole grains per person plus any add-ins you desire. Add enough milk to cover, warm it all up in a pot then pour into a bowl and enjoy! This can be made ahead of time and taken to go if needed. 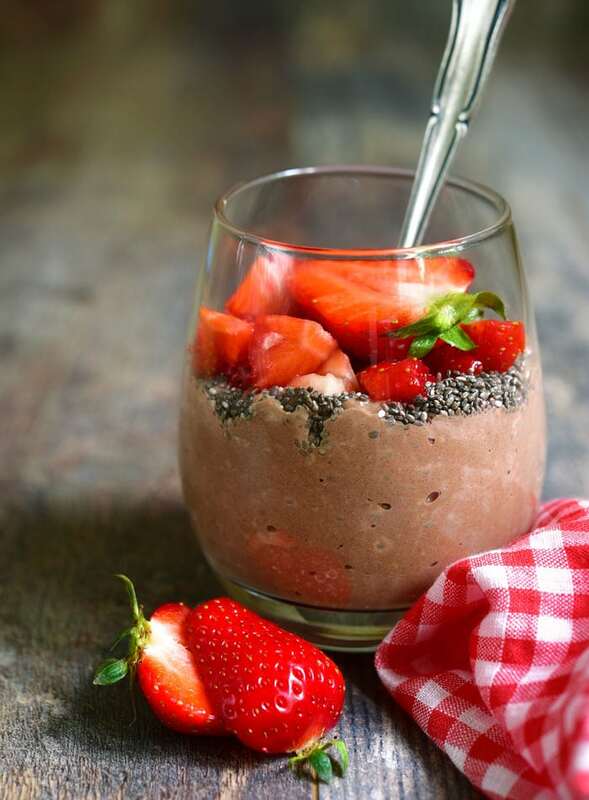 This chocolate chia hemp protein pudding is packed with antioxidants, vitamin, minerals and contains plenty of inflammation fighting omega-3 essential fatty acids. We talked about the important of omega-3‘s in the first inflammation post, so be sure to head over and check that out when you get a chance. This chia hemp seed pudding is rich in inflammation-fighting omega-3 fatty acids, as well as vitamins, minerals, antioxidants and a whopping 12 grams of fiber. Add all ingredients to a blender and blend to combine. Add to a container and place in the fridge for a few hours up until overnight. Add any desired toppings and enjoy. You can substitute the dates with whole leaf stevia powder or extract, pure maple syrup, brown rice syrup or agave nectar. If you don’t use dates, you could also skip the blender and just everything in a container. Mix together everything except the sweetener and then sweeten to taste. I’d recommend starting with a a couple teaspoons of liquid sweetener and adjusting from there. If you’re using stevia, a small pinch or a few drops of liquid extract should do it. Topping suggestions: berries, walnuts, almonds, hemp seeds, cashew yogurt, banana, sunflower seeds, pumpkin seeds, nut butter, tahini. Okay, hopefully that points you in the right direction when it comes to creating plant-based and anti-inflammatory breakfasts. My top picks for breakfasts are probably smoothies, chia seed pudding and porridge but I to go for breakfasts on the sweeter side and don’t have savoury breakfasts that often. Here are a few more ideas for creating anti-inflammatory breakfasts, no recipes needed! Dice a sweet potato and cook it in a frying pan with onion, garlic and spices. You can use a bit of water or vegetable stock to cook it in, or use avocado oil. I use water and cover it until the sweet potato is almost done, then remove the lid and let it finish. I like throwing in a handful of spinach or kale in the last couple of minutes. You could also make this in the oven. 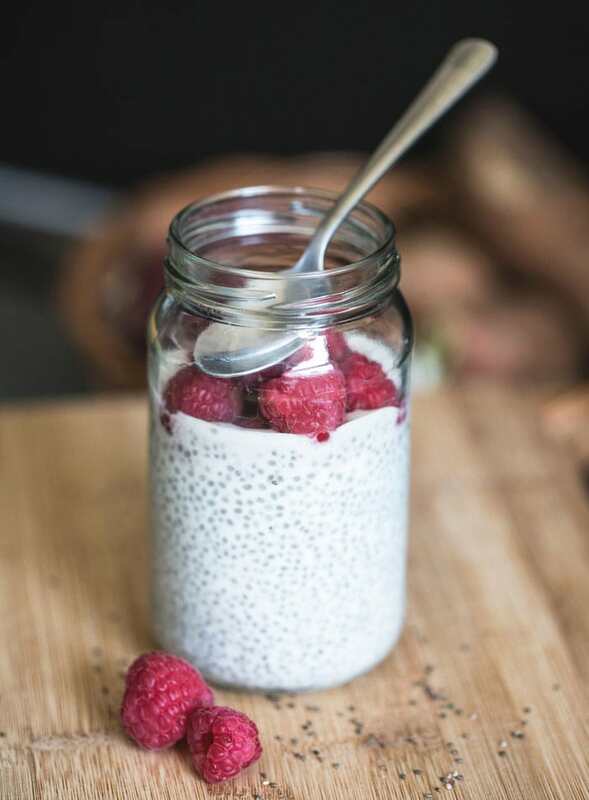 For the simplest chia seed pudding, mix 3 tablespoons of chia seeds with about 1/3 cup of water or milk and let it sit for 30 minutes up to overnight. It’s ready when it’s a thick, pudding-like consistency. If desired, add a drizzle of maple syrup and pure vanilla extract. Once it’s set, add toppings like nut butter, nuts, seeds or fresh fruit. I recommend making the Life Changing Loaf of Bread from My New Roots or choosing a quality, gluten-free store-bought option like amaranth bread. These are one of my favourite breakfasts. They take about 60 seconds to make and they always taste amazing! If you have a well-stock pantry and some fruit on hand, you’re ready to make anything goes breakfast bowls. To make them, just throw everything in a bowl and dig in. I make a batch of some kind of homemade energy bars every week. They’re easy to make, can be customized to whatever you have on and they always taste so good! These are handy if you have to take breakfast to-go. Grab an apple to have along with one. Here are a few recipes you can try. Again, there is no wrong answer. Throw a bunch of stuff in a bowl and dig in! Okay, I hope this post has inspired you to create your own healthy anti-inflammatory breakfasts. Once you’ve got the hang of it and got some creative juices flowing, you’ll discover just how easy it is to make healing and nourishing breakfasts. The idea here is to get you away from that refined bagel with cream cheese you grab on the road, the sugar-loaded breakfast bars that might be in your cupboard or the white bread and processed peanut butter you may have relied on in the past. It doesn’t have to be complicated. Think: eat a variety of whole foods, ditch all processed foods.. It doesn’t have to be expensive either. 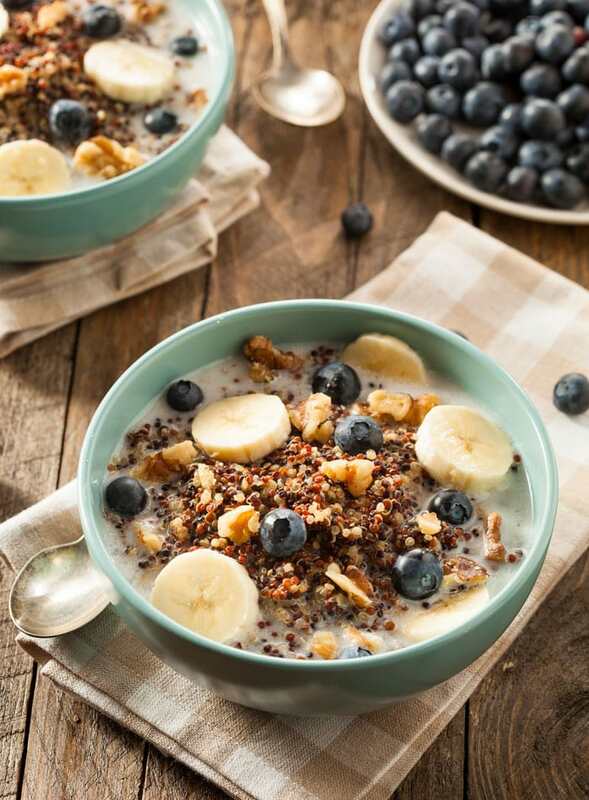 Whole grain porridge, smoothies and breakfast bowls are all affordable options. You don’t have to run out and buy every superfood on this list. All fruits and vegetables are superfoods. Load up on affordable fruits and vegetables like spinach, garlic, onions and broccoli, apples, bananas and frozen berries. From there sneak in whatever nuts and seeds you can manage. I hope you guys enjoyed the second post in my anti-inflammatory lifestyle series. Again, if you missed the first post, you can read it here. I hope you found these ideas practical and are able to incorporate some of them into your lifestyle. Stay tuned for my upcoming post in the series where we’ll be looking at anti-inflammatory entree ideas. If you enjoyed this post, it would be awesome if you shared it on social media. Thanks for reading! Great blog ! Thank you for sharing this information, it a bit to assimilate in one go through. Much of the information I am very aware from others sources as well as my own reshaping of my health and wellness. I made the Pumpkin Spice Latte Smoothie for my Sunday morning breakfast treat, well worked with what I had, the drink was smooth, rich, and creamy ! So happy to hear that, Jeff! Thanks for your comment. I love this post! so many great tips and the recipes all look delicious perfect for my Endometriosis diet. I’ve been meaning to try out the mushroom coffee for a while now, I must get on it! Aww, so glad you found it helpful! Yes, try the coffee, it’s so good! I love apple cider vinegar and if you do use it, you definitely want one with “the mother” in it. I will often drink it with warm water in the mornings for it’s digestive benefits as a fermented food. You wouldn’t lose weight from taking it but it’s a very healthy food you can enjoy mixed with water or used in dressings, sauces and all kinds of recipes. You know I’m all about the anti-inflammatory foods!! So much great I info here whhere to begin?! I am all about my morning routine! I love a couple quiet hours to myself before everyone else gets up! I have hashimottos and I’ve been reading about anti-inflamatory foods and how they can help! I also love that all these nutrient powerhouses are so vibrantly colored! I REALLY hope there is a Running on Real Food book in the works and know I am first in line! I’m really working on the whole routine in the morning thing. I’m big on snooze! That porridge looks AMAZING! All of these recipes look delicious. Love it! Wow – there is so much good information in here! So much to digest. I really like what you said about morning routines though – it’s so important to really set the tone for the day! 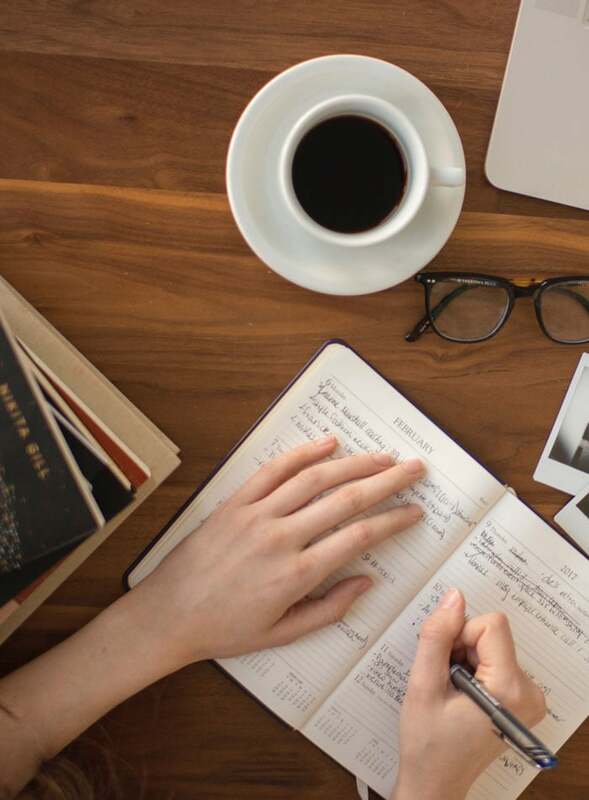 Loved reading your tips for creating a successful morning routine! Can’t wait to start putting some of these ideas into practice and trying the recipes! I loved reading this. So many great tips here. I love the idea of reading a bit from a self help book first thing in the morning. I think that would great change my outlook on the day. I also love that you don’t check social media first thing. It’s the first thing I do when I get downstairs and then I get sucked in forever. I definitely need to take this tip to heart and not go anywhere near it until at least 9 or 10am! I would get sooo much more done! I really appreciate this post as my mornings could use an overhaul. I’m in a bit of a rut. I think I”ll start with that ginger tea and work in some of your other suggestions, too. What a great read! So happy to finally find a blog so informative, where the author has clearly put her whole heart and best intentions into. Sharing with my friend right away! No one can miss on such gem ??????? ?